WASHINGTON—Exasperated Republicans failed April 2 in their effort to short-circuit Democrats’ unprecedented obstruction of confirmation of President Donald Trump’s executive and judicial branch nominees. A motion to move to a final vote on Senate Resolution 50 to change the upper chamber’s procedural rules on nominations was defeated 51 to 48, nine votes short of the 60 required for passage. 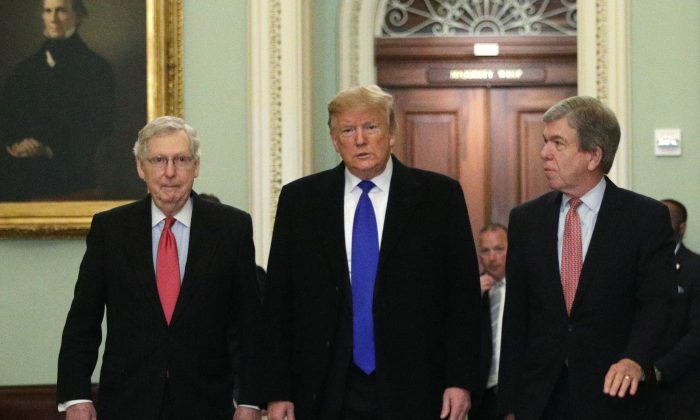 The resolution’s failure now means Senate Majority Leader Mitch McConnell (R-Ky.) must decide whether to use the so-called “nuclear option” later this week in order to speed up the confirmation process of two Trump judicial nominees. Under that option, McConnell will file a point of order against the expected ruling of the Senate’s presiding officer that 60 votes are required to end debate on nominees under the cloture rule. When the rule is appealed, only 51 votes are required to overturn the presiding officer and end debate, thus establishing a new precedent ending the 60-vote requirement. The defeated proposed rule change would have cut debate time on most presidential nominations from 30 hours to a maximum of two hours. The measure was introduced earlier this year by Sen. James Lankford (R-Okla.), after Democrats forced extended debate 128 times on Trump nominees that could only be ended with cloture votes. A cloture vote to limit debate must be supported by at least 60 senators, which is extremely difficult when the GOP has only 53 members. That means at least seven minority party members must agree with the majority. Even then, debate is allowed to continue for another 30 hours after which a final confirmation vote must be scheduled. It’s not unusual, though, for several more days to elapse before the process is finally completed. Many of the 128 nominees delayed by Democrats were ultimately approved with few or no opposition votes, a fact Republicans said proved the tactics were strictly political and not based on legitimate concerns about the officials named by Trump. “These are individuals that have already gone through vetting at the White House,” Lankford told the Senate during the debate before the vote. All Senate Democrats—with the exception of Kamala Harris (D-Calif.), who was absent—and both independents voted against Lankford’s proposal. “At this unusually divided moment in our history, Americans need the Senate to serve its deliberative function in our constitutional system,” he said. Lankford’s proposal is similar to another one that was adopted by Senate Democrats with Republican agreement in 2013 as a temporary measure under then-Senate Majority Leader Harry Reid (D-Nev.). McConnell was Senate minority leader at the time. The Reid–McConnell deal allowed quicker confirmation of President Barack Obama’s nominations. “My Republican colleagues and I joined with Democrats in 2013 and supported the same sort of modest changes to our nominations process through the same sort of standing order. Were we overjoyed that President Obama had won re-election? No, but we still thought he deserved to stand up a government,” McConnell said before the April 2 vote.